This is one of the best cups of coffee I’ve ever enjoyed, smooth and very pleasing to your taste buds. I’ve had the pleasure of drinking over two hundred cups of this coffee and not one was a disappointment. It’s the only decaf I’ve found that I was happy to give up my caffeinated coffee for. Try it, you won’t be disappointed! 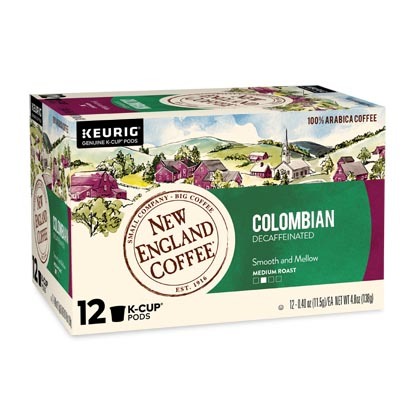 I was really excited while trying my first cup of the Decaf Columbian K Cups. The mesh container seems to yield more flavor. This variety is very robust, not bitter, yet very full bodied. And, in the 20 count, they are individually wrapped, which is great for my B&B guests and Day Spa. From my first cup of Columbian Decaf, I was delighted at the full bodied flavor, rich without any bitterness. The mesh cups seem to allow a more robust finish. I first had this coffee on vacation to Cape Cod this past summer. It was the best decaf I have ever had. Such a full rich flavor that you don’t find in a lot of decaf coffee. I’m hooked! Found some of this on sale at Fresno’s Grocery Outlet. It is the BEST decaff I have ever tasted. Prior to that I had never heard of this coffee company. Now, I just am NOT happy with any other decaff. My clients agree. I like a BOLD taste, but not bitter like French Roast, and a lot of decaffs just taste ‘watered down.’ This tastes like a REAL CUP OF COFFEE, So glad I found you. Best decaf that I have experienced! Great taste with no bitterness. You wouldn’t know it was decaf! My wife found this a Bed Bath and Beyond. This coffee knocks it out of the park, quite the rock star. Best decaff I have ever had!!!!! Bar none.